Pete and Brenda Cashel have owned and operated Terrapin Hill Farm since 1985. The 400-acre farm is located west of Harrodsburg, Kentucky, along the Chaplin river. Fertile river-bottom fields, rolling hills in pasture, hardwood and cedar woods, numerous streams, a mile of river and a 1-acre pond combine earth, water and sky to create a beautiful farm setting. Pete grew up in Pennsylvania, and Brenda is a native of Vermont. Neither of us are from farming families, but when we met we decided to create a business and lifestyle on the farm and since then we can't think of anything else we'd rather do. 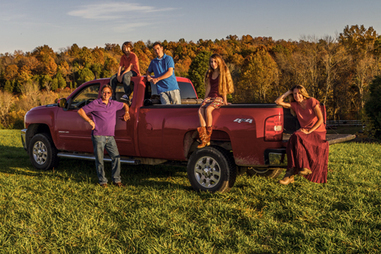 Now we have our own "farming family" with our three children, Kelby, Deanna and Jonah. Since 1995, the primary business of Terrapin Hill Farm has been the production of sustainably grown produce and plants, pasture-raised heritage breed hogs, and pastured poultry, all sold locally in the central Kentucky area. Our simple philosophy about farming is that we are stewards of the land; in order to reap the fruits of the land we must care for it as best as we know how. We follow the guiding principles of organic farming: chemical fertilizers, pesticides, or herbicides are never used on the farm; sustainable agriculture methods such as composting, crop rotation, and soil fertility management are used wherever possible; an effort is made to work with the balance of Nature, rather than to control it. We choose not to be "certified" organic; since we market directly to our customers we can assure them of our high standards, and we encourage visits to our farm to see our farming practices. We are also a certified tree farm, and have participated in several cost-share programs through the state of Kentucky to plant hardwood trees and native grasses. In 2005 we were awarded a Competitive Agri-tourism Award from Kentucky's Agricultural Development Board. This enabled us to make improvements to the farm and to develop it's agritourism facilities. In 2013 we installed a photovoltaic solar system for the farm and can now proudly say that our quest for sustainability has been furthered now that we use the sun to produce our energy. We were honored to receive grants from the USDA Dept. of Rural Development and the Kentucky Agricultural Development Fund to help us achieve this goal. Our business as a wedding venue has grown by leaps and bounds in the last 10 years or so, and in 2016 we were awarded the WeddingWire Couples’ Choice Award, which recognizes the top 5% of wedding professionals on WeddingWire who demonstrate excellence in quality, service, responsiveness, and professionalism. The prestigious awards are given to the top local wedding professionals based on their professional achievements from the previous year and winners are determined solely based on reviews from real newlyweds and their experiences working with Terrapin Hill Farm. We encourage visitors to our farm for any of our events, or for your own private event, or even just to spend the night. We believe that when people get out to enjoy the natural beauty of the land and see where their food comes from, they can begin to discover their own connection to the land and to a deeper sense of spirituality.